Chemical-free healthy living. Removes over 99% of bacteria. Perfect cleaning with just water. For removal of hardened, stubborn dirt and grease. Wash and re-use. Brilliant on pots & pans, crockery and bakeware. Allergy friendly product. Ideal for cleaning and removing stuck-on food, hardened messes and stubborn grease from pots and pans, crockery and bakeware, all using just water. Washing-up liquid may be used with the pad. 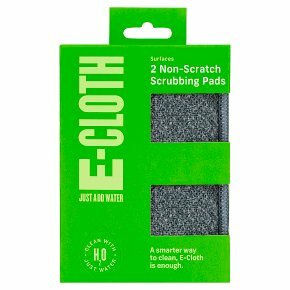 Special features Cleans with just water - Save time No chemicals used - Save money Non-scratch - Safe for use on most pots and pans. How to use 1. Rinse pad and surface to be cleaned with hot water. 2. Scrub the surface to be cleaned. Tip: A small amount of washing-up liquid can be used to assist with cleaning. Caring for your e-cloth Machine wash regularly up to 60°C., using a little detergent and rinse well. Do Not use bleach, which damages the fibres or fabric conditioner, which inhibits performance. If used by mistake, rewash with a little detergent.